We were promised a future filled with jetpacks. While this would make our world infinitely cooler, there comes certain pros and cons to a jetpack. Pros: fly like a bird, avoid rush hour traffic, skip long layovers in Atlanta. Cons: run out of fuel mid-air, engine may burn your backside, deadly collisions. While we canÃ¢â‚¬â„¢t fly into the clouds with a jetpack yet, Jetpack for WordPress is your ticket to the WordPress cloud. The most expansive WordPress plugin ever includes a whopping 30 free modules to supercharge your website. Similar to a personal jetpack, Jetpack carries itÃ¢â‚¬â„¢s own pros and cons. Read on to see if this Jetpack is worth riding. 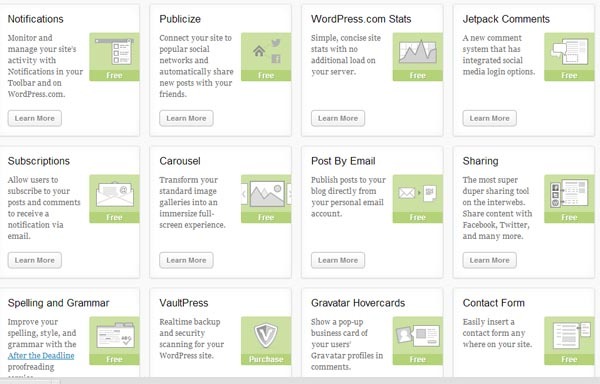 Created by Automattic (who created WordPress.com), Jetpack is one of WordPressÃ¢â‚¬â„¢ most popular plugins over the past few years. 30 premium features (and more added often) are offered for free that are useful to WordPress beginners and pros alike. DonÃ¢â‚¬â„¢t activate all the features, rather pick and choose which ones work for you. HereÃ¢â‚¬â„¢s a sampling of the modules that are essential to optimize your website. WordPress.com StatsThe sheer amount of statistical information is Google Analytics is daunting. If you want an easy-to-understand stat interface, this will work perfectly. Check out a concise graph of your monthly, weekly, and daily stats without leaving WordPress. PhotonJetpack also includes Photon, a fully functional content delivery network. Photon serves your postsÃ¢â‚¬â„¢ images from the WordPress network grid, saving you precious bandwidth. This is especially helpful if you are on a shared server that doesnÃ¢â‚¬â„¢t support unlimited bandwidth. SharingThereÃ¢â‚¬â„¢s a gazillion sharing plugins in WordPress, but Ã¢â‚¬Å“SharingÃ¢â‚¬Â will work just fine. Have your readers share your content with Facebook, Twitter, Pinterest, Stumbleupon, Reddit, and many more services. Create your own custom sharing buttons and configure the services as icons, text, or both. Mobile ThemeIf your website doesnÃ¢â‚¬â„¢t have a responsive theme, you may want to look into Ã¢â‚¬Å“Mobile ThemeÃ¢â‚¬Â. Jetpack will override whatever mobile theme you have now with a minimalistic, blue design thatÃ¢â‚¬â„¢s easy to read. Infinite ScrollThis useful plugin automatically pulls the next set of posts into view when the reader gets to the bottom of the page. This should help your websiteÃ¢â‚¬â„¢s bounce rate. OmnisearchOmnisearch is one of the newest services offered by Jetpack. Search for anything locally on your site. On your WordPress dashboard, simply type in a search request and Omnisearch shows you posts, pages, comments, and feedback containing your search term. With great power comes great responsibility. You must be aware of the limitations and drawbacks of such a large plugin like Jetpack. Beware of Plugin BloatSome Jetpack critics believe all these modules in this plugin will make your website feel just like you after Thanksgiving dinner: sleepy, slow, bloated. If youÃ¢â‚¬â„¢re site is loading slowly and you are not sure whatÃ¢â‚¬â„¢s causing it, the culprit may be resource hog Jetpack. A better alternative to what Automattic has done is to provide a simple checkbox so you can deactivate the modules you donÃ¢â‚¬â„¢t need, instead of going into every module to turn it off or on. Default ActivationAuto-activation can be real annoying if it messes with any part of your site. Jetpack implements live code that could change your siteÃ¢â‚¬â„¢s functionality without notice. Some plugins you donÃ¢â‚¬â„¢t want to update right away for fear of breaking a widget or aspect of the layout. Instead of making activation optional, you now have to get another plugin called Manual Control to turn this Ã¢â‚¬Å“featureÃ¢â‚¬Â off. If you are interested in just the Ã¢â‚¬Å“StatsÃ¢â‚¬Â portion of Jetpack, check out Jetpack Lite. This plugin is one of the first IÃ¢â‚¬â„¢ve seen not to add to a plugin, but rather remove all the modules, files, and code from the parent plugin. Jetpack LiteÃ¢â‚¬â„¢s objective is to cause no additional load on your server. While not perfect, Jetpack is a godsend for beginners who are just getting started with WordPress. However, if you are experienced with the WordPress directory, likely you have found individual plugins that work better for you than the large Jetpack collection. Do you use Jetpack for WordPress? Which modules are your favorites?